Most readers know I am OCD in terms of organization. So, I always had to have to a billfold that had separators – a divider in the larger cash section – one for bills, one for receipts and lots of little side pockets for keeping various things separate. I never fully took advantage of the dividers in the change section of the billfold though….until now. Since Switzerland doesn’t use Euros (they aren’t a part of the EU), we use Swiss Francs day to day. I also keep a small amount of Euro change since we are on a border town of France, and in case I need a bus ticket there, etc. When we arrived in London this weekend, the pounds and pence added a third dimension. I surely have to keep them separate as you can’t tell the coins apart at a glance (or at least I have not become that skilled yet). 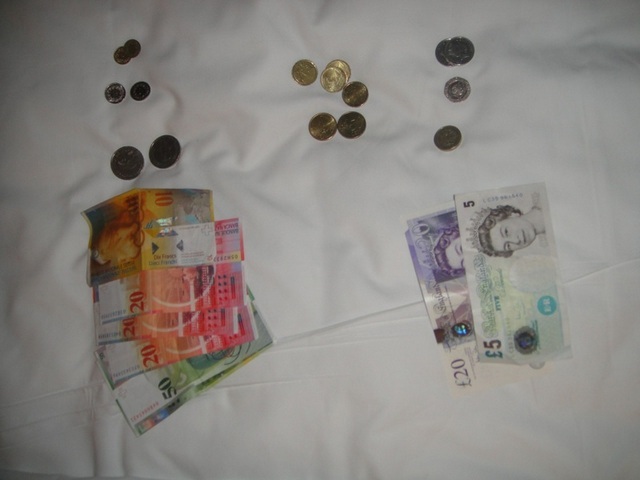 So, I have my little change purse divided up with all the different currencies. I can’t imagine what is was like before the EU & one monetary system for most of Europe! This entry was posted in Cultural Differences, Learning & Growing, Life in Geneva, Travel: Europe, Travel: Within Switzerland. Bookmark the permalink. Yes, i might have to. Gabe scolded me as he found photos of food storage merchanding from the department store here on my camera. I can’t turn it off 🙂 When we move in a few weeks, I’ll have to do some posts for you. The shoebox we live in currently is just a little too small to provide interesting content. Its a mess!